I could have also called this ‘chasing summer’, which is another we feel about it. We are literally trying to avoid winter this year. Hopping from place to place. First to stay in the warmth, during the Fall season of the Northern hemisphere. Then not jumping the gun too early in the Spring, by coming back again. It is a delicate balance and it feels really strange. In South East Asia, it feels like there are two seasons, hot and too hot. Or the opposite of Calgary, where it is 8 months winter and 4 months cold. Down here it feels like 8 months summer and 4 months warm. We are in the that nice warm part. It feels very comfortable for us, yet there are down jackets in the stores. In some ways, if you close your eyes and don’t think about where you are, it seems normal. But then you walk outside into the 30 degree C temperatures, 80% humidity and think, who can possibly wear a down jacket in this weather? Not even the most hard-core slave to fashion could manage to survive in such warm clothes. Begs the question, why are the stores filled with these things? Then there are the signs of “Happy New Year 2018”. Why on earth are these already out on display? There was Christmas music at the International store the other day. It is starting to look very festive, in that way. But it doesn’t feel right. First of all, it is way too early, particularly if these decorations are for the benefit of expats. Then, it seems so out-of-place. It feels to warm to be associating the images of a white winter holiday, with this place. We have thought this before. During a Mexico Christmas vacation, there was a large, inflatable Frosty the snowman on the beach. 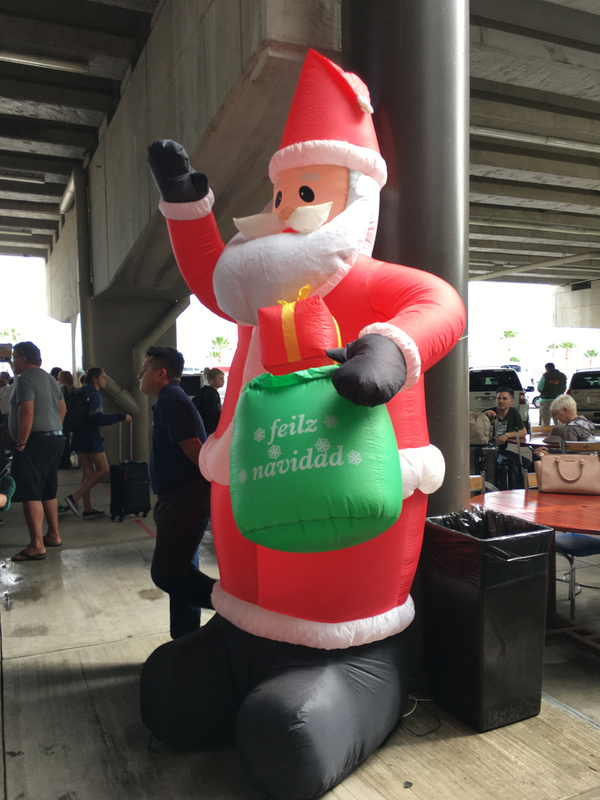 Or a similar Santa at the airport bearing a greeting of Feliz Navidad. OK, that is strange, but we were on vacation for the holidays. Who knew if that got put up in November? Beyond the confusion of season, we are loosing a sense of time. We kind of had it figured out in Europe. When people back home would be awake, how to get a hold of them and when we needed to make ourselves available. Now that has all changed. We are really off the time zone now. Everything has flipped around and we need to adjust our schedule, along with adapting to this new time zone. Makes it hard to know if you are coming or going. There is a strange feeling to all facets of life, everything is unfamiliar. New accents are heard from the people around us who are speaking English and a whole host of new languages. It doesn’t serve us well to express our few known Spanish phrases, just because that is all we are able to say. Time to learn some new ways to communicate the basics. That was part of the reason we did this. To stretch ourselves. Think differently, adapt to new surroundings, be flexible. Exercise our brains. Not to say any of this has been easy, but it has been worth the effort. Everyday we get a little closer, as a family team. We support each other a little more, even while we still have our normal fits and fights. We spend more time together than we ever have, while we still are able to reserve some alone time each day. It is a delicate balance, but in the end we are more kind to each other than we were before. We have to be. The journey is still in the early days, we have a way to go. Once the days are drawing to a close, these daily practices will become a habit. Or that is what I am hoping for!